We never got to do the gag, but I desperately wanted to arrange a Spartacus-style reveal of the various authors who wrote D&D novels under the house name T.H. Lain. The secret spilled before we could make an event of it, but the other authors and I share a sort of fraternity to this day. My participation almost didn’t happen, but I’m glad it did. After I’d finished Black Wolf for Phil Athans of the Wizards of the Coast book department, another editor asked whether I’d be willing to write under a pen name. When I heard the idea was to write short novels with the D&D iconic characters in various adventuring party configurations, I failed my WILL save. With Black Wolf my goal had been, well, somewhat pretentious. I aimed to write a more “literary” game tie-in novel, taking my inspiration less from D&D and more from film and mainstream novels. With the goal of the T.H. Lain novels unabashedly set to epitomize the “D&D experience,” I saw an opportunity to tell a wahoo adventure story that embraced clichés rather than subverting them. I felt freer to dial the humor up to 10. Also, I wanted all of the characters to be non-human, because my Realms stories had featured humans almost exclusively. A complication arose when Phil called me to discuss my writing Lord of Stormweather, the final book of the Sembia series (a longer story for another post). When my D&D editor heard about it, he called to say, “Well, you won’t want to write this little novel under a pen name now, will you?” I assured him I was glad to do both, if the scheduling worked out. He shifted me from the #5 position, and I became T.H. Lain #8, author of The Sundered Arms. The novel features the iconic dwarf warrior Tordek with backup from the halfling rogue Lidda, the half-elf bard Devis (or “Bunny,” as you’ll understand by reading the first chapter), and the elf druid Vadania. 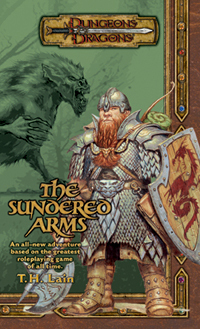 While the reviews for The Sundered Arms have been fewer and less glowing than those for my other books, I think it’s a lot of fun to those who enjoy a romp rather than an epic. It let me exercise writing muscles I hadn’t stretched before, and it gave me a chance to add a couple of tiny details to the lore of D&D dwarves (notably the dwarven definition of “twins”). If you like audiobooks, you can snag a copy of The Sundered Arms at Audible. Note: While my secret comrade T.H. Lain has given us all permission to post via the Facebook account, I’m never the T.H. Lain who posts there. Still, stop on by and meet some of my doppelgangers sometime.